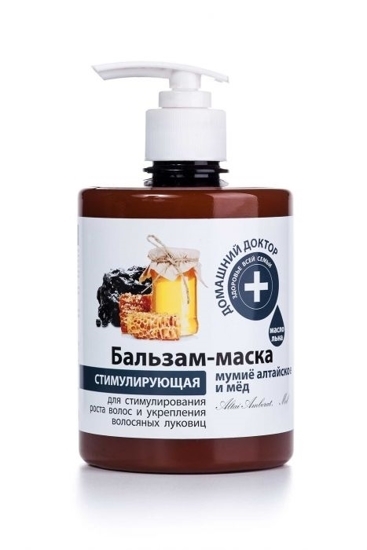 Balsam-Mask for hair "Homemade" 500 ml,mummy Altai and honey stimulating - Russian Food Online Shop "Babushka"
A full complex of vitamins to increase the strength of your hair - all this and more is contained in the balsam-mask "Mummy Altai and honey" from well-known Ukrainian producer "family doctor". With your hair will not fall out or break.¶¶Balsam-mask contains a concentrated blend of micronutrients to stimulate the growth of hair and maintaining the health of their follicles. The composition of such combination is more than 35% of linseed oil, and biomes from more than 80 organic and inorganic components.¶¶All these components have a great impact on your hair and will create around them an invisible protection. The hair will become manageable, shiny and silky, will be revitalized.¶¶Method of application: apply to the root zone and distribute through hair from root to tip, rinse with water. Do not apply under a shower cap.